Mr. Yang Kuang (Why Yang), a Hong Kong activist, disappeared for 41 hours in China when he tried to visit his friend Liu Xia, wife of Liu Xiao Bo (Nobel Peace Prize winner). He was then “sent home” by PRC China on 10th March 2013. No assistance was given to Mr. Yang during his “disappearance” and Mr. CY Leung, the Chief Executive, responded to the press’ enquiry that the government has not received any request for assistance. Hong Kong journalists who went follow the story were beaten up by 4-5 men outside the residential area, which is public space, of Mrs. Liu’s flat. A TVB reporter talked about the incident here. According to the reporter, these 4-5 men rushed over to the journalists and started to beat them up right away. The police arrived after the journalists called for help, but they did not arrest any of the attackers and told the journalists that they should not ask any questions about the attackers. The TVB reporter also said that her reporter identity card was taken away. Mr. Ma Fung-Kwok, HK Deputy to the National People’s Congress, commented on the incident that “When in Rome do as the Romans do” and said that the key is whether the Hong Kong journalists were covering the story legally. Mr. CY Leung, the Chief Executive, said reporters should be protected and respected as they cover stories legally. 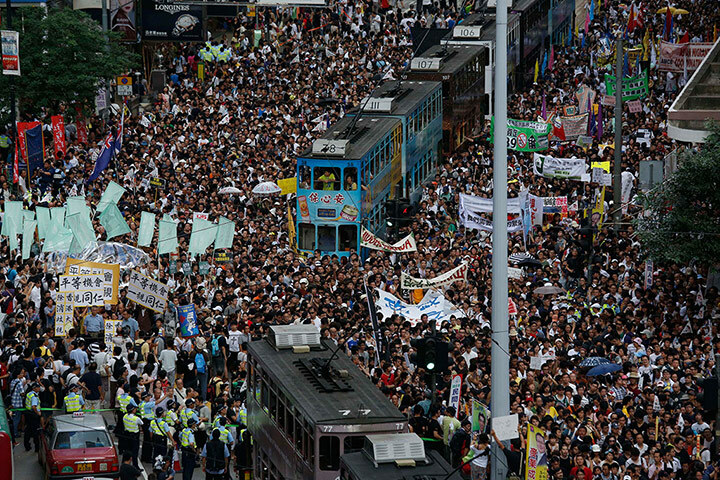 Public outcry in Hong Kong for thorough investigation, and condemn PRC/China for their barbarian actions. 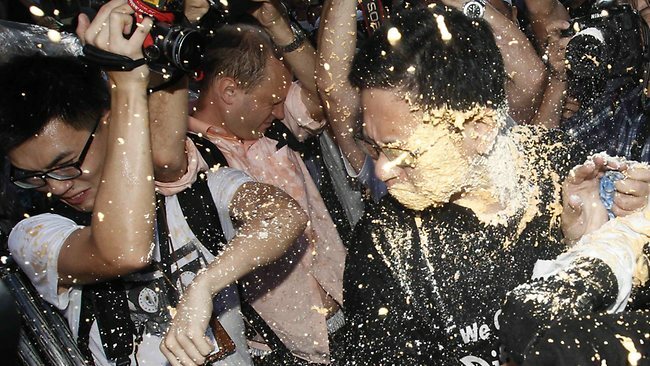 The HK Journalists Association also expressed their fury against the attack. These “ordinary men” are suspected to be plainclothes police – one of them was recognised by the media as a PRC policeman. A female HK reporter currently working on an assignment about Why Yang (also translated as “Yang Kuang”), a HK activist who went to the building block where Liu Xia lives (wife of Nobel Peace Prize winner Liu XiaoBo who’s been under house arrest for over 2 years with no legitimate reason) was surrounded and beaten up by at least 5 police in China. Do You Think Hong Kongers are Qualified to “Tolerate and Forgive”? 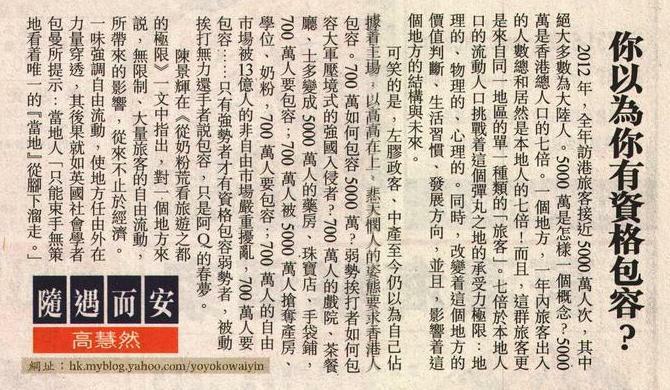 In 2012, Hong Kong recorded the total of 50,000,000 tourists, and the majority of them are mainland Chinese. Let’s put this number into context. 50,000,000 visitors is seven times of Hong Kong’s population. Can you imagine a place received tourists amounted to seven times of its population? In addition, these tourists are mainly from the same country. The number of floating population of a tiny area amounts to seven times of the area’s population, putting tremendous pressure of this place, challenging this place’s maximum capacity, namely: geographical, physical and psychological capacities. At the same time, the influx of visitors is changing the value, lifestyle and direction of development of this place, and more importantly, affecting this place’s structure and future. The irony is, fake-left-wings politicians and middle class still believe that they are the host of this place. They, with an attitude of being superior and pretend to be humanitarians, ask Hong Kongers to tolerate. how could 7 million people tolerate and forgive 50 million people? How could you ask the disadvantaged to tolerate and forgive the invasion of a much stronger nation which armies can be easily mobilised? The cinemas, local eateries and co-op stores that once belonged to the 7 million people, are turned into pharmacies, jewellery shops and handbag stores that belong to 50 million people. The houses, school spaces, formula powder of these 7 million people were taken away by the 50 million people, and the 7 million people have to tolerate and forgive. The free market of 7 million people is being severely disrupted by a non-free market owned by 1.3 billion people, and the 7 million people have to tolerate and forgive… It is always the privilege of the stronger side to tolerate and forgive the weak and disadvantaged. Asking those who are being bullied and pushed around to tolerate and forgive is a self-deception concept. An article by Chan King-Fai (a Hong Kong commentator) called “The Limit of a Tourist Destination Unvealed by Formula Powder Shortage” said that to any place in the world, a massive amount of tourists entering it uncontrolled can affect it substantially, not only on its economy. Focusing purely on free flow of tourists, allowing a place to be penetrated by an outside power, the consequence could be just like Zygmunt Bauman said “helplessly shackled to localities that are slipping away from their grasp“.